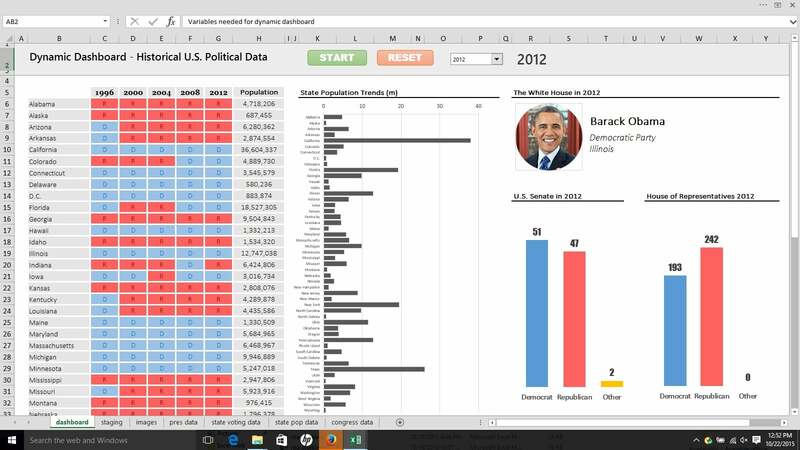 Who doesn’t love a dynamic, animated Excel dashboard? In the following post, I delve into the details of how I created this dashboard. It’s not a full cell-by-cell account of how I did it, because that would require an article at least twice as long, but rather a look at the various steps and thought processes along the way. This was a project I’ve had at the back of my mind for a long while. The timing and motivation finally came together when I recently started teaching the Data Analytics course for General Assembly, which involves Excel and dashboarding, so it tied in nicely and was a chance to revisit some interesting facets of Excel. So I set aside a couple of days to execute this idea from concept through to publishing this blog post (it ended up taking more like a week all told – time comes in small blocks these days with a newborn 🙂 ). I figured historical US Political data would provide a rich and interesting dataset to visualize and animate. So I went hunting for voting data, State population data and Presidential data for the past century. This project began with pen and paper, simply sketching out a few ideas of what info and charts I wanted to include. I knew it would be interesting to look at a century’s worth of voting data alongside information about the Presidents serving during that period. Following that, I thought adding US State population estimates would also be interesting. Yes, it’s pretty rough but it helped shape my initial ideas. 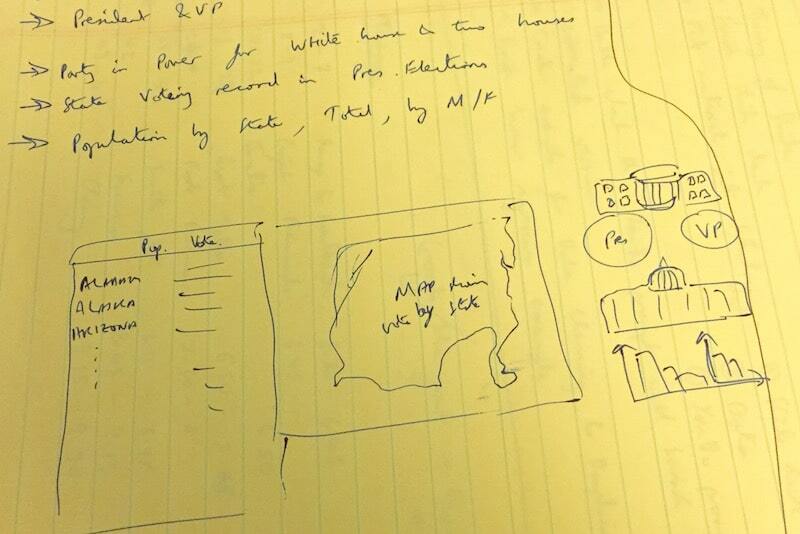 You can see several elements in the sketch made it into the final dashboard at the top of this page, namely the table of states, the Presidents data and the two charts bottom right (representing the Senate and the House of Representatives). 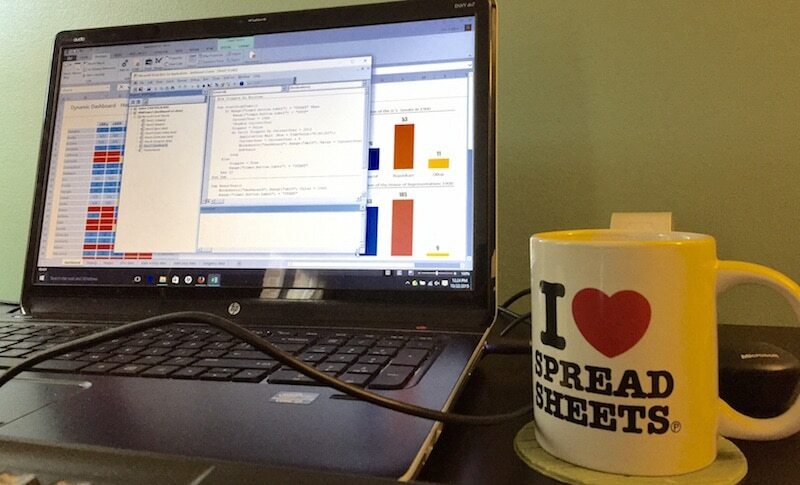 Next up I busted out the “I <3 Spreadsheets" mug! It's guaranteed to give an extra 10% to one's Excel skills when filled with strong English tea. Where did I get the data from? Similarly, I got data on the history of US State voting records from Wikipedia and again used the importhtml() formula to scrape that data into a Google Sheet as a first step. Finally, I noticed that certain states, Alaska and Hawaii, were “missing” population estimates for the early part of the century, which at first seemed odd. After some further reading, I found that these states weren’t actually formed until the 50’s, hence the missing data. So my workbook has four sheets containing raw data: Presidential Data, State Voting Data, Congress Data and State Population Data. When I say “Staging the data”, I mean preparing the data and setting it up into aggregated tables ready to drive the dashboard. The overall driver of all the visuals in the dashboard is the YEAR selected by the user (or automatically by the animation). Since my lookup formulas all run off this variable year, the data returned by the lookups changes when a different year is selected. Cell G5 contains this year variable and so drives the dashboard. I use it in all the lookups in the staging sheet and in the dashboard sheet to get hold of the necessary data. The Senate Dynamic and Representatives Dynamic are two similar tables, again using exactly the same principle of a variable year value linked to the dashboard and then a dynamic lookup to the raw data. These two tables drive the two charts in the dashboard, showing the composition of the Senate and the House of Representatives. 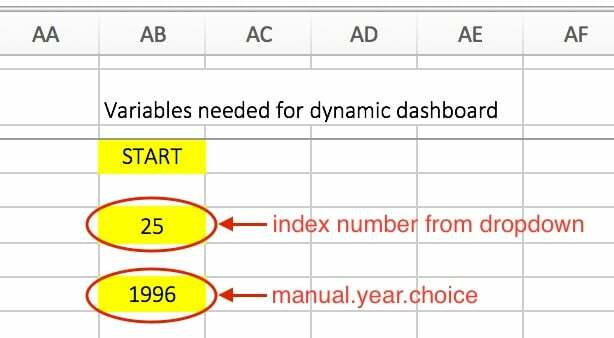 The Date List for Data Validation dropdown is simply a list of the years I want to display in the dropdown menu that the user can use to interact with the dashboard (see the VBA section below). The first part of the dashboard I implemented was the grid map of States and Presidential voting records, on the left side of the dashboard. Across the top of this table, I have five column headings containing year values, which change when the user activates the controls section of the dashboard. I used conditional formatting to color the cells Blue if they equalled “D”, red if they equalled “R”, grey for the “N/k” results (some states did not exist at the beginning of the period, e.g. Hawaii, see data sourcing section above) and gold otherwise (for occasions when a state voted for someone other than Democrat or Republican). Lastly, I applied a thick white border to the whole grid to give some separation and achieve a cleaner look. Adding information about the President was relatively straightforward. I used a VLOOKUP() formula to lookup the year value in the Presidents data table and return the name, party and state for that year. I had to set the fourth argument of the VLOOKUP (called the range_lookup) to TRUE, as the years were not exact matches. Changing the profile picture display was a little more tricky. The idea here is to update the profile picture on the dashboard to show a picture of the President based on the name shown. I’m indebted to Excel guru Sumit Bansal for his informative post on how to do a picture lookup using named ranges and a linked picture – a seriously cool trick that I hadn’t seen before. Thank you! Definitely check out his blog post for a full explanation of how to do this bit of magic. What follows here is a brief description of how I applied this method to my dashboard. What this does is take the Presidents name on the dashboard (in cell T7) and find it in the column of President’s names in my images table, then return the corresponding profile picture and load that into the named range presidents_profiles. Phew! Then I add one of the profile pictures to the dashboard and link that picture to the presidents_profiles named range. When the President name on the dashboard changes, the linked picture and named range formula work their magic and hey presto! the new President’s profile picture appears. This was a straightforward Excel bar chart running off the State Population – dynamic table in the staging worksheet. I formatted the x-axis to display the population in millions, with only major gridlines showing every 10 million increment. I set the bars to black to remain nonpartisan. 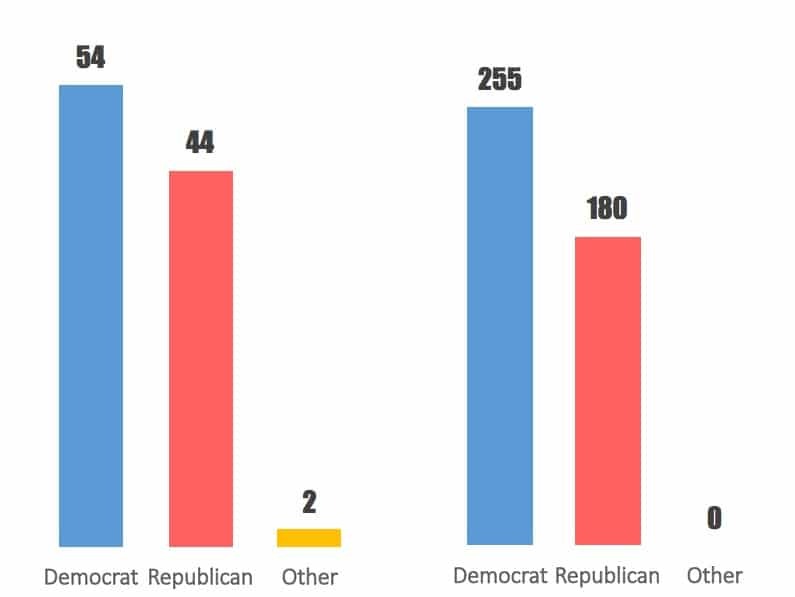 These were two fairly simple column charts, based off the Senate Dynamic and Representatives Dynamic tables in the staging worksheet. I set the x- and y-axes to have no lines showing, removed the gridlines, added red/blue/gold color scheme and added data labels, to get the clean, minimal look I was after. Now I had all of my visuals set up in the dashboard, it was time to add some interactivity. This was the final major piece of the puzzle and I used some basic VBA to implement an animation option and a manual year selection. Excel guru Chandoo published an article last year on how to build a basic timer using VBA, which was helpful when creating my own code. I’d recommend checking that example out as a primer if you’re new to VBA. On the dashboard now, near the centre of the header section, I added a rounded rectangle shape (Insert > Shapes > Rounded Rectangle) and in the formula bar, I type =start.button.label. This links the shape to the cell with the word START in it, so that START shows up on the rectangle shape. Here, I declared the variable Stopped and gave it a data type of Boolean, meaning it can only be TRUE or FALSE in value. Then I declared a sub procedure called startStopTimer(). I then linked the rectangular button to my startStopTimer() sub-procedure (right click the rectangle, then Assign Macro… > startStopTimer() > OK). Now, when a user clicks the green START button it fires off the startStopTimer() sub-procedure. What the heck is going on here then? 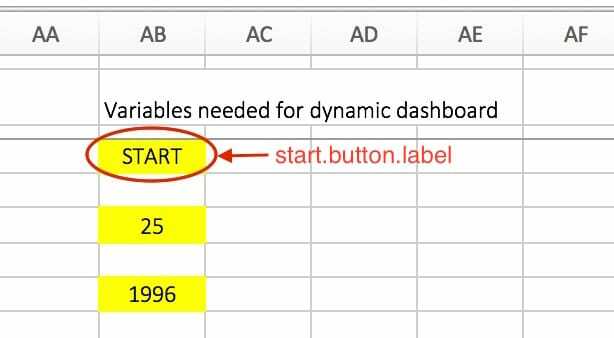 First the VBA code checks the start.button.label cell with the statement Range("start.button.label") to see if it equals the string “START” or not. If the start.button.label cell does not equal START (because it equals STOP), then we enter the ELSE part of the sub-procedure. Here we set the Stopped variable to True and change the start.button.label to START, ready for the animation to start again. As with the START/STOP button, I had to link the RESET button to the code (right click the Reset button rectangle, then Assign Macro… > startStopTimer() > OK), so that the code would execute when the button was pressed. I also added a manual dropdown menu (Developer > Insert > Combo Box), allowing a user to manually choose a specific year. The following code then handles the logic by simply setting the year variable to whatever is chosen from the drop down menu. The next step is to assign this ChooseYear() macro to the combo box, so that it fires when the combo box is used. The final wrinkle to deal with concerns the combo box returning a value representing the index of the item selected, rather than the year. For example, my list contained years as follows [1900, 1904, 1908,…, 2008, 2012] so if a user selected 1904, the output was 2, if they selected 2008, the output was 28, and for 2012 the output was 29. So I needed to convert this index number back to a year value for the lookups. and then naming this cell manual.year.choice so that the VBA code could find it. The final VBA code is on my GitHub account in this VBA repo. I formatted the header row with a light grey fill and a dark grey bottom border. I froze the top three rows to lock the dashboard title and controls to the top of the screen. I obviously used blue and red to represent the two main political parties. However, rather than use pure blue and pure red (very intense and not easy on the eye), I used more muted variants that are softer and easier to look at, without losing any of the meaning. If I was a real stickler for detail and had the time, I’d see if the parties have official color guidelines and base my color scheme off that. I hid the column of variables lurking at the side of the dashboard, to ensure that users wouldn’t see them. I also hid all of the other sheets containing the data and the staging data. There is no need for these to be shown to the end user, and in fact leaving them showing risks users altering your data. All of these changes were relatively minor and didn’t take long to implement, but they make a disproportionately large impact on the aesthetic quality and ultimately, the impact of your dashboard, so it’s definitely worth taking this final step. Of course, our work is never done and not a moment passed after the metaphorical ink had dried, before I began thinking about improvements and next steps. I had to remove many of the state labels because they were so crowded, leaving only the largest state names. When I showed it to my wife this chart didn’t make any sense without me having to explain it (and she is one smart cookie). Radar charts are difficult to understand and even harder to read any actual information from, especially since I’d removed many of the State labels. So, it failed as a visualization and therefore had to go. Replacing it with a simple bar chart was a huge improvement. Moral of the story – beware of all the fancy charts out there, as they are rarely an improvement over their simpler, humbler brethren. I had also hoped to include a choropleth map of the states showing the voting records, but this is a complex and challenging project, and one for another day. 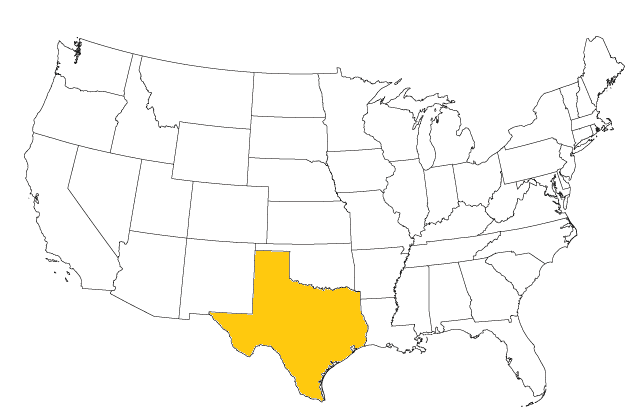 So instead, I thought about adding a state map for the President’s home state, which would dynamically update alongside the profile picture, but decided it wasn’t good ROI for the time it would have taken. I also felt it was somewhat gimmicky and wouldn’t be adding anything substantive to the dashboard (which is the number 1 criterion for inclusion). The population chart shows states but they don’t line up with the voting record data per each state. Also, having the population column there is perhaps redundant, given the information in the chart. If I had more time and this was being built for a client rather than for fun, then the variables to the side of the dashboard would be tidied up and placed somewhere on the staging sheet, so there’s nothing lurking on the dashboard sheet that isn’t dedicated to the purpose of showing information. In this same vein of tidy up, I would have used more named ranges to make my formulas neater and less error-prone if I was doing this again. Charts could be condensed and additional data or information be displayed. Yes, this is definitely possible, but since this was a highly visual project, I think visual impact would be lost to dilution by having even more information displayed. Also on the profile pictures, they don’t quite update fast enough to keep pace with the changing data when using the Auto “START/STOP” feature. As you can see in the top GIF, there’s a slight lag in the picture updating, so that the wrong face is sometimes showing against the President’s name. Thoughts, comments, areas for improvement? Leave a comment, I’d love to hear your feedback! Want exclusive Data Analysis and dashboard tips? Join 5,000+ others and get a copy of my free ebook of Excel and Google Sheet tips!